Many tales have been written that feature herbs in a rather prominent position – my real difficulty with this post was limiting it to just a half dozen books when I really wanted to write about all of them, many of which feature enchanted forests, witches, princesses, gloriously colourful tales of worlds that never existed. I’ve always loved herbs – the names conjure up so many images, can be enough to set you dreaming before you even start to look into the stories and tales surrounding them. Some of my favourite books feature herbs and herbalists as their main protagonists, and I wanted to share some of these with you today. First up – Thornyhold by Mary Stewart. This delightful book is a firm favourite of mine and is mentioned first as possibly one of the oldest of my current favourites. Geilis Ramsay is a spinster, who grew up in a rather bleak mining town in Northern England, with a gentle father who was vicar of the local church, and a mother who had a will of iron and not much tolerance for anyone. Geilis had spent a few years in her very young childhood in a gloriously lush and green part of the country, and had dreamed of trees and grass and animals for most of the rest of her life. The tale revolves around her relationship with her mother’s cousin, a fantastic woman with a propensity for herbal medicine, who often carried around a crystal ball and eventually left her house, the titular Thornyhold, to our heroine Gilly. This wonderful house forms a safe haven for Gilly where she decides what she wants from life, and grows into herself emotionally, eventually falling in love. A really beautifully written story, with likeable characters, no villains and a happy ending – what more could you want? Herbs feature quite prominently in this one as Cousin Geilis is a herbalist, and the younger Geilis ends up becoming one herself. The key to the still room is buried in a bowl of herbs, as well! Next up is Patricia Mckillip’s ‘Winter Rose’. If you have not read this one and love tales of mystery and enchantment that make you look at the world differently when you put them down, this is most definitely the book for you. A delightfully eery, mysterious little story about faery and how we interact with it, it will leave you literally spellbound. Rois Melior lives with her father and sister on the edge of an enchanted wood, and, being a free spirit, she spends most of her time rummaging around amongst the leaves and plants, bringing home huge varieties of different stuff – usually barefoot and with her hair in her eyes. She loves to stand in rings of toadstools and knows all the secret ways of the forests. One day, deep in the wood, she sees a man emerge from light – Corbet Lynn, the heir of Lynn Hall. Both the man and the ruins of his ancestral home are under a curse, and Rois – and later her sister Laurel – find themselves ensorcelled by the man and the mystery behind him. This is one of my absolute, all time favourite books, utterly delightful. Of course, we’d have to follow one tale of Faery with another, this time ‘Hannah’s Garden’ by Midori Snyder. The garden in this story is a huge, wild, entangled spiral herb garden created by Hannah, the ancestor of the two main characters in the story. Hannah was a herbalist and healer who made a bargain with Faery and ended up with the stunning spiral garden that was a portal between the worlds. Snyder mentions all sorts of lovely woodland herbs in this wonderful tale, mostly American ones, and reading the story is like greeting an old friend – just lovely! If you love this, you will probably love the rest of the Faerielands series – Charles de Lint’s ‘The Wild Wood’, Terri Windling’s ‘The Wood Wife’ and Patricia Mckillip’s ‘Something Rich and Strange’. 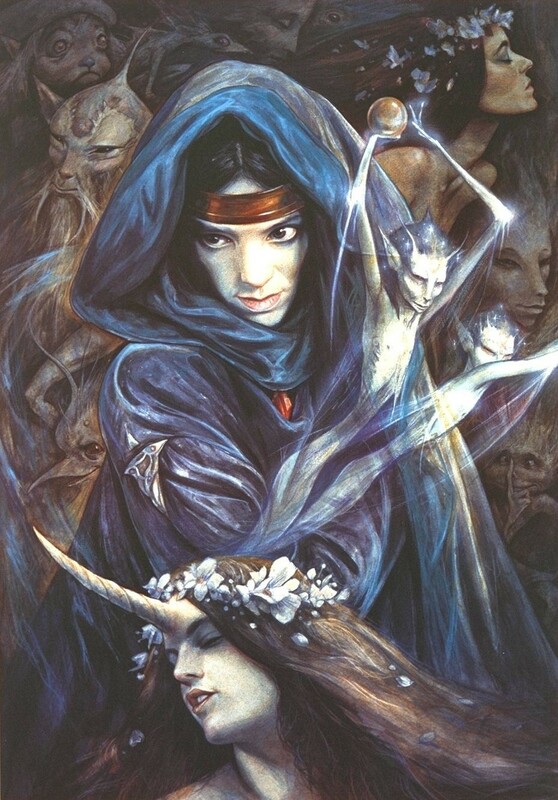 Taking a long step sideways from Faery, we have ‘The Court of the Midnight King’ by Freda Warrington. This is basically a different version of the Wars of the Roses, set in a world that is only a short step away from ours. The main characters are delightful, and the female protagonist, a girl named Kate, is a wise woman and healer who follows the ancient worship of the Mother Goddess. I love pretty much everything Freda Warrington has written, but this story somehow still manages to be something rare and lovely, even when compared with the rest of her writings, rivalled only by Elfland and Midsummer Night, her two latest books. The main characters are particularly unforgettable. Next – Garden Spells, by Sarah Addison Allen. This is a really lovely romance about a woman who lives in an old house in Carolina, USA. She is one of a long line of women who have certain talents not often spoken of by the rest of the town, though they’re a bit of an open secret. This particular lady grows plants in her garden that she uses to produce food and drink that bring about a magical effect in her customers – like Honeysuckle wine on 4th July to make you see in the dark, for example. This is one of my favourite easy reading books – it is a gentle, delicate story that is perfect for long, sleepy summer afternoons. The characters are mostly very likeable, with the one villain who gets his come uppance at the end, at the hands of the bad tempered but enchanted apple tree that lives in the Waverley garden. 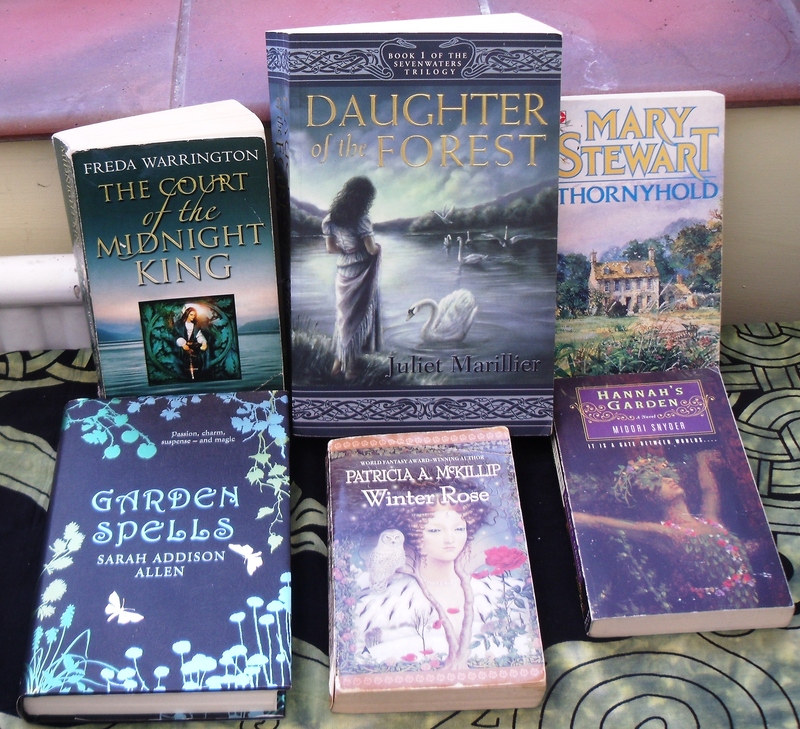 Last but certainly not least – Daughter of the Forest, by Juliet Marillier. This is a retelling of the seven wild swans fairy tale, which features a girl named Sorcha as the main protagonist. The book follows her struggles as she tries to free her brothers from the curse cast on them by their evil stepmother. The thing that is particularly interesting to me as a herbalist is that this girl was a herbalist herself, and spent much of her time gathering and making medicines for the local community. The descriptions of the place are lovely and the characters are generally very likeable, all except, of course, for the evil sorceress! Note that this book does have one particularly disturbing and upsetting scene in it which is not for the faint hearted so if you’ve been through any kind of sexual trauma, be warned that this may not be the book for you. An alternate version of the story that does not have the unpleasant content is ‘The Swan Kingdom’ by Zoe Marriott, which is also lovely and also features herbs in a fairly large role. I hope that you find something entertaining to enjoy from this list of some of my favourite herbal fiction books! Lovely and refreshing. I had forgotten all about fictional herb lore. Of course, my personal favorite, although its a subplot, is The Mists of Avalon. These books in your post are totally new to me, I can’t wait to read some of them! Thanks for taking the time to write about them. I enjoyed!